I Absolutely Love Wainscot! And You Should Too. I absolutely love a gorgeous wainscot. Perhaps because it fits beautifully into my criteria of sophistication and clean lines. 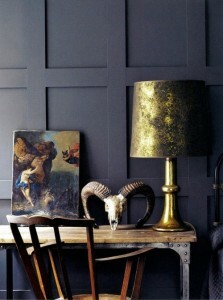 Or perhaps it’s because wainscoting is a fantastic way to dress up a wall by giving it dimension, depth and interest. For instance, take this first photograph. The walls are black yet very reflective. Here, color and wainscot bring out the dimensional definition of the moldings and give an otherwise plain wall a splash of sheer elegance. Growing up in France, I have seen my share of wainscots. They are an integral part of the old world home. Originally, their primary function was to isolate stone walls and keep rooms warm, often used from floor to ceiling. By integrating decorative moldings, creative symmetry, tapestry insert s and intricate inlays or carvings, wainscots earned panache and transformed into stunning decorative elements. Today, wainscoting is a wonderful way to break up a wall when high ceilings seem intimidating. The application can be vertical or horizontal, delicate or rustic, traditional or contemporary clean. The options are endless. Using a wainscot can be a wonderful alternative to “just paint”. It gives your walls character and helps define the flavor of a room. Additionally, it can tone down a loud wall paper by dividing the surface and grounding the room. Recently, I used wainscoting to transform an ordinary foyer and corridor by defining the walls and coffered ceiling. The result was a dramatic and glamorous entryway. I applied a gorgeous metallic natural weave wall paper to the panels, the ceiling and the bare walls between the moldings. The entry is truly stunning and the space is fully transformed. I am genuinely looking forward to conceiving my next wainscot application. 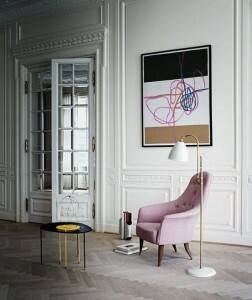 Adding a little drama and a lot of character to a space is always an excellent remedy to the monotony of everyday ennui.